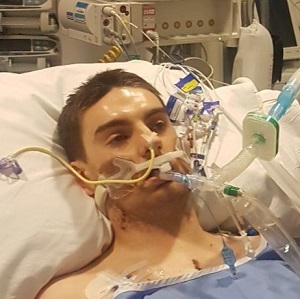 Jim Lynskey, 22, from Birmingham needs a heart transplant and had a LVAD (Left Ventricular Assist Device) heart pump fitted as a bridge to surgery. However his pump failed in October - he was told by his doctors he was the first person in the UK to have a sudden LVAD failure. Jim was studying at Sheffield Hallam University when the alarm sounded on his pump. He had an urgent 12 hour operation to fit a second LVAD. Jim said: “I heard and felt the pump switch off and I thought ‘this is not good’. It was shocking because you never expect it to happen. Jim spent his 22nd birthday recovering from surgery and he’s temporarily off the waiting list while he recovers. Jim had a meningitis virus infection in his heart when he was a child which caused his heart to fail. He said: “I can’t receive a transplant this Christmas but there are around 300 people on the heart transplant waiting list who desperately need that ultimate gift. I really want everyone to tell their families: ‘I want to save lives by donating’. “It’s hard to think about a transplant for myself at the moment because I know it would be a massive operation and I feel it would be the final throw of the dice in a way.